When connected to a VMware View session you may have noticed that you do not have access to change any display settings. This can be a problem for users that have a large monitors as View auto sets the desktop resolution for best clarity. In my experience, I have had users complain about how small icons and text are shown within their View session which at the time I didn’t have a solution for. Thankfully, VMware have bundled a group of ADM templates containing many options for tweaking View components such as the View agent and PCOIP parameters. You can fine these ADM templates on any one of your connection servers in the following location. 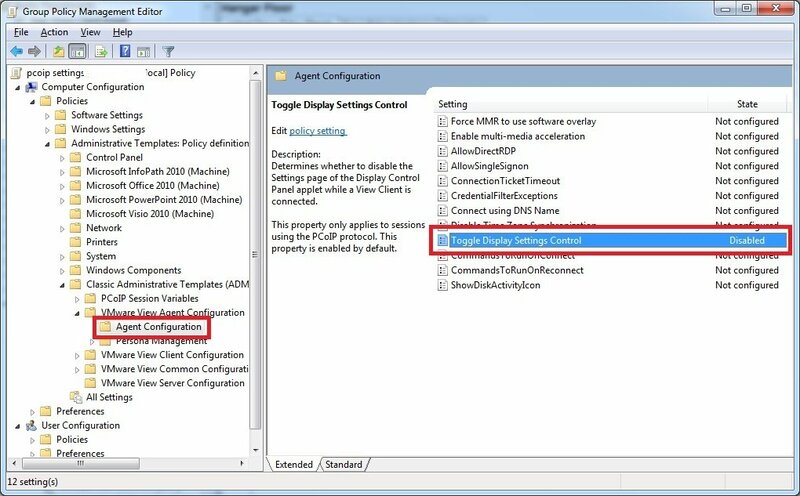 Once you have created a new GPO and loaded these ADM templates into your group policy manager, navigate to the following policy. To enable the use of the Windows display settings, you need to disable the Toggle Display Settings Control. Equally you can add the below registry key to a logon script to achieve the same result.